The subject of aluminium and Alzheimer's disease has been plagued with controversy. This controversy has served to obscure much of the scientific research in this field, and subsequently has obscured the possibility that aluminium is a contributory factor in the aetiology of Alzheimer's disease. 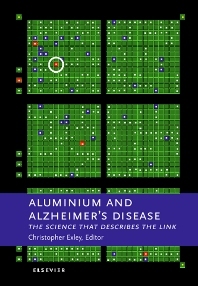 This book brings together many of the world's leading scientists researching aluminium and life and contains their critical summaries on the known facts about aluminium toxicity in man and to offer an opinion on the implications of this knowledge on a link between aluminium and Alzheimer's disease. The subject areas of the chapters were chosen to reflect the myriad of ways that aluminium is known to impact upon mammalian physiology and function and range from clinical studies, through animal models of disease to the detailed biochemistry of aluminium toxicity. Chapters are also included on epidemiology and other factors involved in the aetiology of Alzheimer's. This is the first time that this subject has been treated in such a comprehensive manner. The research detailed in each chapter, includes the latest research in the field, it has been critically appraised and this appraisal has been used by each author to present an informed opinion of its relevance to aluminium and Alzheimer's disease. The chapters are much more than reviews; they are a statement of the state of the art and of what the future may hold for research in this field. As a whole they show the high quality of research that has been carried out in our efforts to understand the toxicity of aluminium in man and that we are far away from discounting the possibility that aluminium is a contributory factor in the aetiology of Alzheimer's disease. For students of and researchers in areas ranging from the neurosciences to environmental health and safety. Also for professionals concerned with environmental issues and pollution. Preface. Why is research into aluminium and life important? (C. Exley). Aluminium induced disease in subjects with and without renal failure - does it help us understand the role of aluminium in Alzheimer's disease? (P. Altmann). Aluminium-induced bone disease: implications for Alzheimer's disease (K. Abreo). The epidemiology of aluminium and Alzheimer's disease (V. Rondeau, D. Commenges). Absorption of aluminium from antiperspirants and vaccine adjuvants (R. Flarend). The aetiology of Alzheimer's disease: diverse routes into a common tau pathway? (C.R. Harrington). The association of aluminium and neurofibrillary degeneration in Alzheimer's disease, a personal perspective (D.P. Perl). Aluminium and gene transcription in the mammalian central nervous system - implications for Alzheimer's disease (W.J. Lukiw). Behavioral studies in animals: past and potential contribution to the understanding of the relationship between aluminium and Alzheimer's disease (M.S. Golub). Aluminium as an experimental neurotoxicant: the neuropathology and neurochemistry (M.J. Strong). The rabbit model system for studies of aluminum-induced neurofibrillary degeneration; relevance to human neurodegenerative disorders (J. Savory, O. Ghribi, M.M. Herman). Aluminium and iron in Alzheimer's disease (P.C. d'Haese, M.E. de Broe). Alumiunium toxicokinetics at the blood-brain barrier (R.A. Yokel). Aluminium toxicity in erythropoiesis: mechanisms related to cellular dysfunction in Alzheimer's disease (A. Nesse, G. Garbossa). Aluminium, membranes and Alzheimer's disease (P. Zatta, M. Suwalski). Iron homeostasis and aluminium toxicity (R.J. Ward, R.R. Crichton). Oxidative and inflammatory properties of aluminium: possible relevance in Alzheimer's disease (S.C. Bondy, A. Campbell). Glutamatergic neurotransmisson, aluminium and Alzheimer's disease (V. Felipo). Aluminium-induced alteration of phosphoinositide and calcium signalling (W.R. Mundy, T.J. Schafer). The interaction of aluminium with peptides and proteins (T. Kiss, M. Hollósi). Calmodulin, aluminium and Alzheimer's disease (B. Solomon). Aluminium, tau and neurofibrillary degeneration (R.-W. Shin). The association of aluminium and &Bgr; amyloid in Alzheimer's disease (C. Exley, O. Korchazhkina).